Elements present in the protagonist’s artwork shift the focus of the story to a hallucinogenic trip as he attains enlightenment. 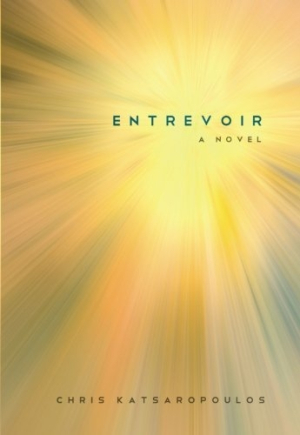 A work as conceptual as the protagonist’s art, Entrevoir, by Chris Katsaropoulous, tells the story of an artist who grapples with a recent decision to relocate from New York to the French countryside to make what he considers his masterwork. The book deals with issues of art and its audience, and the artist and his ego. Jacob toggles through realities: his quotidian existence where he faces the failure of the opening of his latest piece, which was once imbued with all his hopes for artistic success; and the attainment of an unembodied wisdom that shares threads with shamanic paganism, Buddhism, and Christian mysticism (though many traditions flow together in the stream of expanded consciousness Jacob relates). Jacob, in his hallucinogenic states, undergoes a multitude of lives and deaths as he grows closer to an unencumbered sense of ego, or as he experiences a flash of insight: “The soul is just a vessel, I am not even the soul.” As he delves deeper into his new state of awareness, the alternating realities show an artist grappling also with his attachments to others, particularly in his marriage. Through an understanding of the purpose of his art, he learns that painting was an attempt to lift things higher into light. Early in the novel, Jacob reflects on his place as an artist amidst the state of modern art making: “And this, in his view, is what has distinguished him from other less prominent artists of his day—he leaves the mystery in place, lets each viewer of the piece decide what it means to them. Most of his fellow artists weave long commentaries to be printed in pamphlets the viewers receive at the door of their exhibits … in many cases this conceptual blather is more artfully conceived and compelling than the installation itself.” In the pages that follow, Jacob wrestles with ideas of selfhood amidst luxurious descriptions of transcendental states. He walks the fine line of self-indulgence and conceptual enlightenment, shedding all boundaries between separate selves that he criticizes and grapples with.